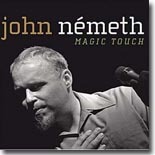 Exciting newcomer John Németh can sing AND play the blues harp. His new CD, Magic Touch, is featured as our Pick Hit. Fort Worth guitarist James Hinkle gives the listener a taste of a lot of different musical styles, and it's all top-notch stuff. His new one, Blues Now, Jazz Later is this month's Surprise CD. A classic revisited is T-Bone Walker's T-Bone Blues, one of the prolific guitar legend's finest moments. It's featured in this month's Flashback section. It's a very good month for new releases, with the What's New section featuring new releases from the scintillating Roxanne Potvin, Pine Leaf Boys, Soul Deacons, Watermelon Slim, Tommy Castro, JJ Grey & Mofro, The Rounders, Doug Cox / Salil Bhatt, and more.